Metro will continue its popular open streets grants. Photo of 2015 CicLAvia on Ventura Boulevard - by Joe Linton/Streetsblog L.A.
At its meeting yesterday, the Metro Board approved moving forward with the next two years of its open streets grant program. This will be the third two-year grant cycle. Earlier cycles of the Metro Open Streets Grant Program have supported ciclovías – CicLAvia and other open streets events – throughout L.A. County. To host local events, cities apply for competitive grants from Metro . Past Metro grants have extended open streets events throughout much of L.A. County. Map from Metro staff report. In 2013, the Metro Board approved the program which, since 2015, has provided $2 million annually to cities to host open streets. According to the Metro staff report, the $7.74 million the agency has distributed supported 28 events in 32 jurisdictions. Nineteen of these events have already taken place; nine more are planned through December 2018. The next event, (correction added 3/28) is San Fernando Street Fest on March 31 in the city of San Fernando. Just one month away on April 22, is CicLAvia – Heart of the Foothills and will roll through the cities of San Dimas, La Verne, Pomona, and Claremont. Based on today’s board approval, overall funding will remain at $2 million per year. Also continuing is the weighted scoring used to encourage multi-jurisdictional events and events in disadvantaged communities. There are some changes to the new cycle of grants. Metro is adding scoring criteria to encourage data collection and innovation. In order to try to geographically distribute events throughout the county and to encourage municipalities to work together, Metro staff had proposed a somewhat complex population-based formula, which would have capped per-event grants based on the number of cities involved and their population. Representatives from BikeSGV, the city of San Dimas, and the San Gabriel Valley Council of Governments gave public testimony urging the agency not to cap funding as tightly as staff recommended. Metro boardmember and Duarte Mayor John Fasana moved to modify and simplify the capping formula, allowing for higher event caps for smaller cities. Then L.A. City boardmembers Mike Bonin and Eric Garcetti offered amendments to cap events hosted by larger cities – Los Angeles and Long Beach – differently. Ultimately, the board negotiated a simplified compromise version, initially proposed by boardmember and L.A. City Councilmember Paul Krekorian. 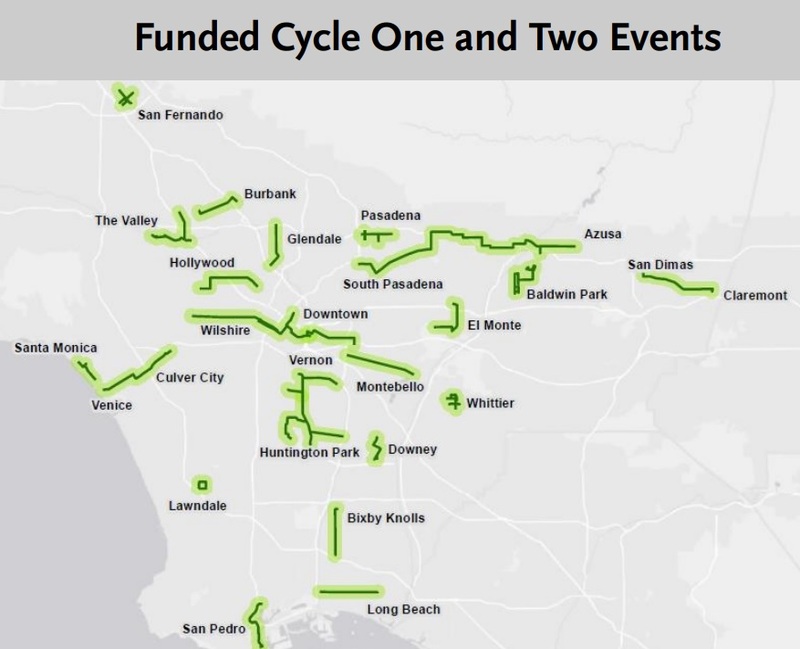 For this cycle, all open streets events grants will be capped at $500,000. Metro staff and board will use the competitive grant process to assess all proposed events and to distribute funds to cost-effective, collaborative, and geographically-distributed proposals. With the framework approved, Metro staff expects to call for applications in April, and for the board to approve the next round of funded events in September.